You’ve created a quality blog and it’s actually attracting visitors and sparking engagement. But what you ultimately want is to convert those visitors into customers – and if that doesn’t happen, then your marketing efforts are going to waste. There could be a million reasons for this, but a likely culprit is one most people never consider: you’re not tailoring your content to your buyer persona. What is a buyer persona, you ask? It’s a collection of qualities and traits you would likely find in your ideal customer. And if your blog isn’t generating leads, it’s quite probable your content is failing to attract these important individuals. Before we go over a few strategies to help you cater to them, let’s first quickly go over what is required to develop a buyer persona. First, start with what you know about your existing buyers and brand supporters. 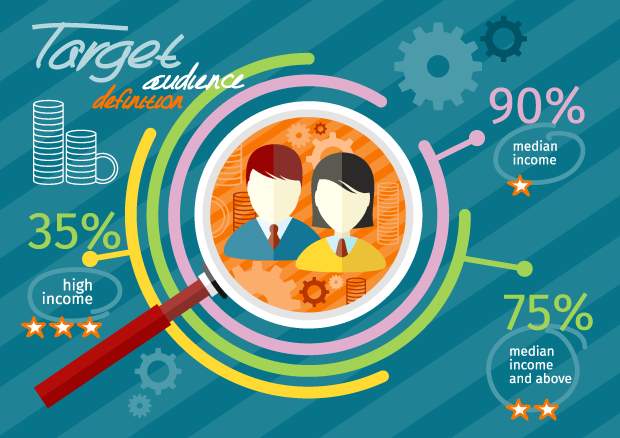 Next, add in what your market research reveals about your leads and potential buyers. Finally, bring it all together to create a fictional character of your ideal buyer. Be specific and include things like age, demographics, spending habits, family status, wants, desires, and more. Once you’ve done this, a clear picture should develop. And if you cater to this clearly-defined buyer persona, conversions will be easier, and you’ll save time and money by not targeting the wrong people. To learn more about developing your buyer persona, be sure to check out How to Create Buyer Personas With Google Analytics by Social Media Examiner and 150 Buyer Persona Questions You Must Ask by Sujan Patel. Now that you know how to find your buyer persona, let’s go over how to create content that speaks to them. Here are six tips to help you do just that. It might seem like common sense, but instead of pondering and guessing at what your ideal buyer wants to read, why not ask them? If your blog already has an audience of regular readers, and hopefully some mailing list subscribers, use a tool like SurveyMonkey to run a small reader survey with your existing traffic. It’s quick and easy to get going (and potentially free depending on survey size), and the results will provide you with a snapshot of how your current readership feels. This is exactly what Bryan Collins did. He posted the results on his blog and found many of his readers wanted more practical writing tips, rather than the productivity methods he was writing about. Your business does have a blog, right? Then you can try doing what Derek Halpern of Social Triggers recently did – posing a question to your blog readers in one of your blog posts. Derek, being an entrepreneur, might have had an idea for a new product and needed some feedback from his audience. Or, he could have just been receiving emails from other struggling entrepreneurs and wanted to know if others felt the same way. What better way to tailor your content than by giving your audience exactly what they ask for? Derek received hundreds of responses and in his next post revealed that everyone had “too much on their plate.” So, he discussed how he handled his projects over the years and offered some sound advice to his loyal readers. Try following in Derek’s footsteps: have your audience tell you their struggles, and then provide them with your interpretation and solution. This helps build credibility. And if you targeted your question correctly, it can relate back to your product or service. Find popular blogs and businesses in your industry and take a good look at the type of content they put out. What posts spark engagement? Do certain topic areas get more comments, social shares, and inspire more involved discussions? Spend some time going through your competitors’ sites; there’s nothing wrong with a little bit of competitive research. Use the knowledge you acquire to create better content with a unique angle – filling any gaps in the market. Your content needs to help your visitors move from a just looking state to a maybe I want to buy state. When this happens, your visitor becomes a lead – someone who’s shown interest in what you’re offering, but who isn’t quite ready to pull the trigger. It’s your job to convince and nurture these valuable leads and eventually turn them into buyers and hopefully strong brand supporters. Two ways you can do this is: through your blog content and with content upgrades. On your blog, you want to provide enough actionable advice and strategies to convince a reader that you’re credible and that they can learn even more if they buy from you. Mariah Coz does an amazing job at giving away her best tips and strategies on her blog. You might think this is bad business, but she’s proof it’s not. Her latest product launch generated $450k in 14 days. On her blog, she empathizes with the readers’ pain points, hints at the favorable outcomes of buying her course, and uses typical sales techniques like dispelling myths and anticipating objections. This is all packaged up in a way to make the reader feel as if she’s directly talking to them – and only them. A truly optimized funnel, and the nearly half-million in sales reflect this! You can start doing this by writing about success stories people have had from using your product, or by stressing what readers who don’t have your product or don’t use your service are missing out on. This acts as a nudge to your ideal customer and can motivate them to take action. When you start providing content your buyer persona enjoys, you can add even more value and help them move along your funnel by including a content upgrade in your posts. A content upgrade is a post-specific lead magnet normally implemented with a 2-step opt-in form – we call them MonsterLinks. Let’s say a person lands on your blog post about 14-Point Blog Post Checklist to Use Before You Hit Publish. As they start reading they see you have a call-out for the ability to download the checklist. Since the reader is obviously interested in crafting a perfect blog post – they wouldn’t be reading your post otherwise – an offer of having the checklist handy is going to be very appealing to them. When the reader clicks on that link, a popup is shown where they can enter their email address and download the checklist. Once readers enter your marketing funnel by exchanging their email address for your content upgrade, you can use your email marketing automation to turn interested readers into new business. And, it’s a powerful way to grow your list quickly! Quora is a question and answer site and is popular with many influencers like Neil Patel and Syed Balkhi. It’s also a great platform to use for generating traffic. 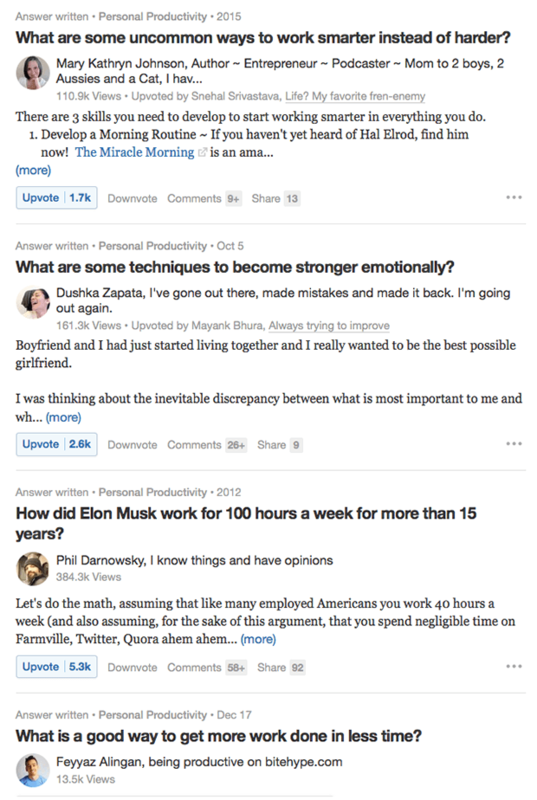 To start tailoring your content to your buyers, visit Quora to see what questions people are asking that are related to your product or service. 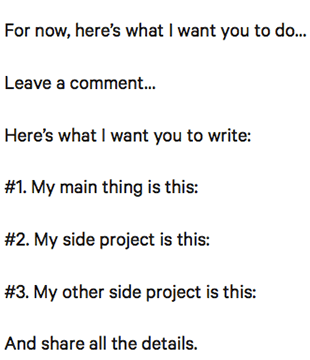 For example, if you’re a productivity app creator, here are some questions being asked about productivity on Quora. By going over the questions and answers related to your niche, you’ll start to get a feeling of exactly what people want to know more about, making it easier to come up with blog topics, content upgrades, and lead magnets. Content comes in many forms. Podcasts have been around for nearly a decade, and thanks to increased broadband and mobile speeds, video is quickly becoming a dominant medium among bloggers and entrepreneurs. Let’s look at three platforms – YouTube, Periscope, and Blab – to see how you can use them to connect with your buyer persona. YouTube is often thought of as the second largest search engine and with “how to” searches growing 70% each year, it’s the perfect opportunity to educate people with your expert knowledge. Upload your recorded videos to a YouTube channel. 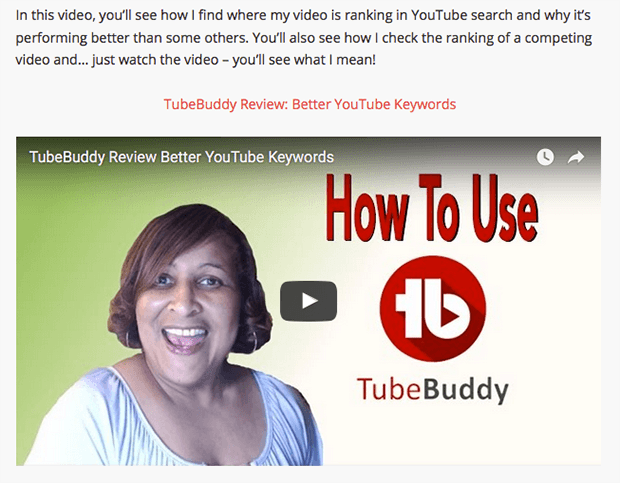 You’ll get listed in the YouTube search results and also benefit from any searches performed on Google thanks to universal search. Want to display your videos on your website? Just paste YouTube’s embed code into a blog post and you’ll keep visitors on your site while they watch your videos. Ileane Smith of Basic Blog Tips has a YouTube video marketing course and shares her YouTube videos on her blog for her intended buyers. Building trust in your audience is key to moving them from visitor status to loyal customer. A great way to build that trust is to be transparent in your actions and Periscope lets you do this. It’s a live streaming app you can use to broadcast on the go. What’s unique about this platform is the video by default stays live for only 24 hours and then expires. By posting raw video footage of you, your audience gets an exclusive sneak peek of who you really are and if you are the expert they’ve come to believe from your blog posts. Mariah Coz uses Periscope to speak to other entrepreneurs – her buyer persona – by having specific discussions related to her products. Blab is the new social media craze and it is a live conversation platform. You can have up to three other people join you in a discussion and with enabled chat options, your blab fest is a truly interactive medium. Many bloggers and entrepreneurs are using Blab to hold mini seminars or interviews. Dre Beltrami of The Branded Solopreneur uses Blab to showcase her expertise in branding, which speaks to potential buyers interested in her upcoming branding course. Ask a group of successful bloggers what their favorite tools are. Ask them if they have a secret weapon. It’s almost a given BuzzSumo will come up. Social networks are all about people sharing things they like with others. 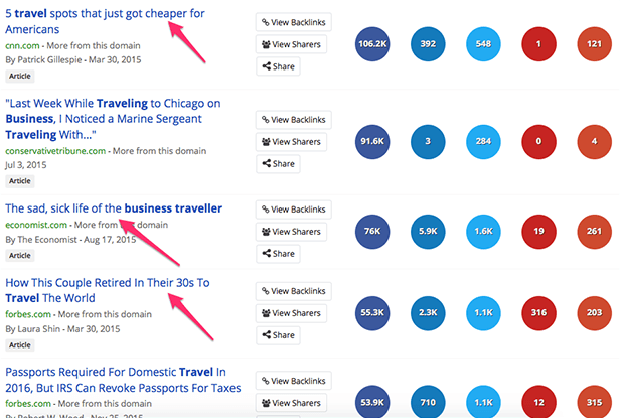 BuzzSumo tracks this activity and reveals the most shared pieces of content in your niche. This is invaluable knowledge you can use to craft better content around popular topics. As an example, let’s see what the results are for the keyword business travel. We will filter out videos, giveaways and infographics and look at results from the past year. If you’re in the travel industry you can get a snapshot of what topics are highly shareable, giving you an indication of what the mass market is searching for. With these results you can write about various topics on traveling the world when you’re young, tips on combating the feeling of isolation when you travel for work, and where the cheapest spots are in the U.S. for travel. Your site should serve to acquire new business as well as work to maintain what following you already have. That’s why creating exceptional content that’s tailored to your buyer persona is a win-win for everyone involved. It enables you to build your brand’s authority with your intended audience, and it attracts qualified prospects to your sales funnel. By asking your audience what they want from you, and by performing a bit of industry research – both on competitors’ sites and through social sites like Quora and BuzzSumo – you’ll gain a better perspective on the type of content you need to create. Finally, don’t forget content comes in many forms. By “speaking” to your buyers using the latest social video platforms, you can build popularity, transparency, and spark engagement. Over to you – how are you creating content your audience craves? Elna Cain is a freelance writer and digital marketer who offers ghostwriting, copywriting and blogging services. She works closely with B2C and B2B businesses providing digital marketing content that gains social media attention and increases their search engine visibility. So many great tips in this post-o-epic! It’s so important to tailor ALL of our content to the specific peeps we’re trying to reach. Qualify them, baby! It’s unfortunate this seems so counterintuitive when you’re getting started, but this post gives tons of ideas how to focus your voice and WHY that will be invaluable to newbs. P.S. Thanks a whole heapery for the shoutout in this post, Elna!!! Thanks so much. You are right about making sure all your content tailors to your ideal customer, especially if you want to sell something. I had to learn this once I started my course. Instead of writing generic freelance writing topics, I honed in on writers’ pain points and insecurities to help them realize they are not alone and there’s a solution (my course). Now, every time I sit down and write a blog post, I always think how this will relate to my buyer persona. BTW I love your Blabs and you are such a great person to learn about branding! I’ve learned so much from you and can’t wait to see your branding course. You will smash it. I call my person “Jane”. Glad you liked the post! I feel the same way about all the bloggers I mentioned. What an awesome post it is! Using content that is designed for our clients is the best way to hit the target. And, to do this, I love the tips you mentioned. There is no better place than Quora to find what’s exactly boiling in the heads of your readers/customers. Using surveys is also a great idea. I just finished off one by Ian Cleary of RazorSocial. Speaking to potential clients makes them feel they are in direct connection to you and make your brand more approachable. I loved this tip. And yes, Ileane maam rocks there. Glad you found some tips to help you tailor your content. I have yet to do a survey for my subscribers, but it’s something I’m definitely interested in doing in the near future. Yes, speaking to potential clients does make a client trust the blogger, entrepreneur or small business more. I enjoy watching videos and participating in blabs as it shows the true personality of the person!